For the second time in what has been a frigid winter in the Northeastern United States, Niagara falls has come to an icy halt as the six million cubic feet of water that typically flow over the falls every minute has frozen over. 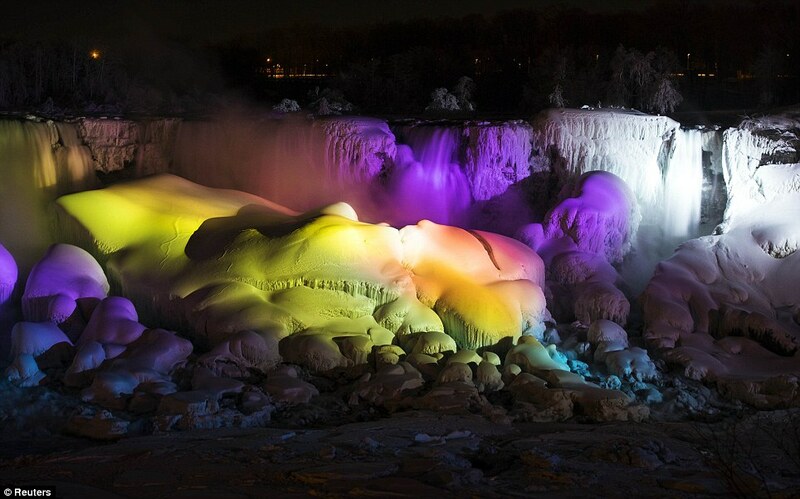 The flow of water over the falls typically can withstand icy temperatures like those that have frozen much of the country this winter, but Monday's high of 9 degrees Fahrenheit brought Niagara Falls to a standstill - and photographers were there to snap some stunning images of the frozen waterfall. In January, another record-breaking cold front managed to freeze the mighty falls in a 'polar vortex' that turned the cascading water to ice - and affected about 240 million people in the U.S. and southern Canada. No thaw is expected anytime soon, as temperatures at the western New York tourist attraction will dip below 0 degrees Fahrenheit Monday night through Tuesday morning.